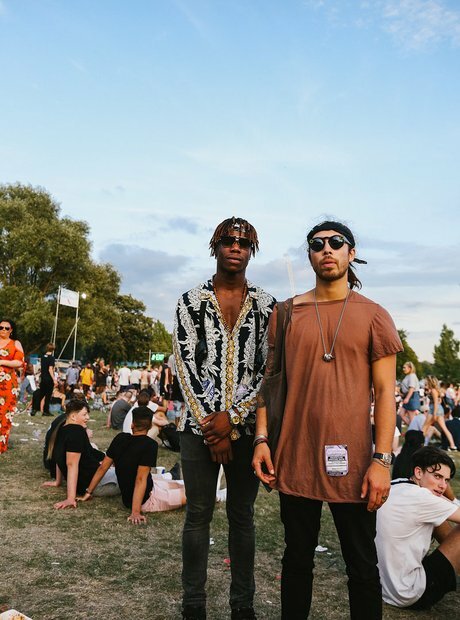 Here's what everyone was wearing at Finsbury Park's Wireless Festival. 1. Let's take a look at what everyone was wearing at 2017's Wireless Festival. 2. Adidas and Camo were stand-out trends at this year's festival. 3. Sunnies at the ready. 4. Camo was popular with artists as well as fans, with Zara Larsson wearing Pink camo on stage. 5. Capital XTRA's Manny Norte wore a stylish Biggie Smalls t-shirt and sneaker protectors. 6. While Capital XTRA's Toni Phillips was spotted in the VIP section wearing a Future-inspired mask. 7. The sun was out and dungarees were on. 8. Were you spotted down at the festival? 9. There were amazing vibes down at Finsbury Park. 10. Leopard print flares looked good on this lady. 11. Bum Bags are the way forward. 12. Wait is that a Chance The Rapper dungarees we see?